A wonderful honor! The Village of Pinecrest Council will conduct a public hearing, pursuant to Ordinance 2000-6, to consider the co-designation of No. Kendall Drive, between Red Road (SW 57th Avenue) and SW 60th Avenue, as Rabbi Baumgard Road, honoring Temple Beth Am Founding Rabbi Emeritus (z"l) Herbert M. Baumgard., who passed away on April 15, 2016. The co-designation is honorary and will not affect existing property or mailing addresses. Interested parties are invited to appear, and we urge Temple Beth Am congregants and other community members to attend the public hearing to show their support for Rabbi Baumgard and the Baumgard Family. She will deliver a speech of vital importance to the Jewish People ... She will talk about her work for US-Israel relations and her recent trip to Israel. Since 2014, the Greater Miami Jewish Federation and the Hebrew Free Loan Association (HFLA) of South Florida have been working together to support The Making Miracle Babies Fertility Fund. Started by Michelle and Matan Ben-Aviv in honor of their son, the innovative loan fund empowers South Florida Jewish couples with fertility obstacles to pursue parenthood via In Vitro Fertilization (IVF). Thanks to a generous donation from Reggie and Jeff Goldstein, whose son and daughter were adopted, HFLA of South Florida has expanded the fund to include interest-free loans for adoption. The Goldstein Family Adoption Fund will provide $24,000 in interest-free loans, which can be used to cover the birth mother’s medical and living expenses, adoption and attorney fees, social worker fees and court costs. The Making Miracle Babies Fund provides couples with an $18,000 interest-free loan for IVF treatment. The Goldstein Family Adoption Fund will provide $24,000 interest-free loans. Adoptions can cost from $25,000 to $60,000. The loans will be used to cover the birth mother’s medical and living expenses, adoption and attorney fees, social worker fees and court costs. “Jewish tradition places a great deal of emphasis on the concepts of family, children and continuity. But not every couple can have children of their own. That’s why The Hebrew Free Loan Association of South Florida, with a generous donation from the Goldstein family, has launched this newest fund,” said HFLA Executive Director Andrew Weinberg. The Goldsteins, who are donors to Federation, were introduced to HFLA of South Florida through Federation’s Director of Philanthropic Initiatives, Simon Kaminetsky. Infertility affects 6.7 million women in the U.S., or about 12 percent of the reproductive-age population. Couples often are faced with this difficult decision: Should they begin what might become a long and very expensive series of infertility treatments, or should they consider adoption? HFLA of South Florida is working with Elizabeth Schwartz, a local adoption attorney, to identify potential couples interested in adoption. “For a lot of people, one of the biggest impediments is the incredible cost of adoption,” Schwartz said. To be eligible for an IVF loan through the Making Miracle Babies Fund, applicants must be Jewish, between the ages 25 to 40 years, and first time parents. HFLA also requires a letter confirming the applicant’s eligibility for treatment from a licensed IVF physician. Those who meet the criteria can receive up to $18,000. They must provide two credit-worthy guarantors and must repay the loan within 48 months. To be eligible for an adoption loan, at least one of the applicants must be Jewish, between the ages of 25 and 50 years, and first-time parents. Those who meet the criteria can receive up to $24,000. They also must provide two credit-worthy guarantors and repay the loan within 48 months. All applicants must be U.S. citizens or permanent residents and must have resided in Miami-Dade or Broward county for at least one year prior to submitting a loan application. Who’s coming Ice Skating? 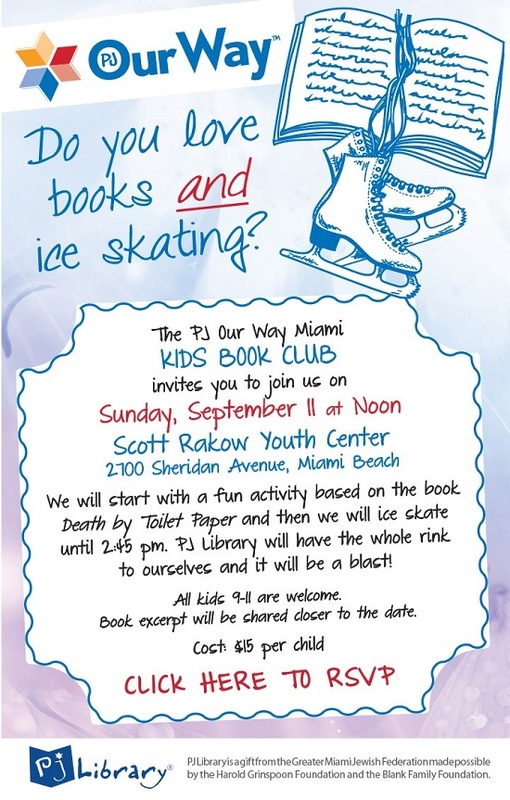 The PJ Our Way Miami Kids' Book Club invites you to join us on Sunday, September 11 at Noon for a book activity based on “Death by Toilet Paper” , followed by ice skating until 2:45 pm. We’ll have the whole rink to ourselves and it will be a blast!! All kids 9-11 are welcome. Wednesday, September 7, 7:30 P.M.
Movies at the MBJCC: Exclusive Sneak Preview of "The People vz. Fritz Bauer"
Join the Miami Beach JCC and the Miami Jewish Film Festival present an exclusive "sneak peak" Florida premiere of the film "The People vs. Fritz Bauer" on September 1st. WIZO FL Presents DENNIS PRAGER on September 21st! 92 Street Y: What is Jewish Culture? "IBA News From Israel"; "ILTV News From Israel"
"JBS News Update"; "In The News"; "Election 2016"
The Jewish influence that made America's Music GREAT! The Countess de Hoernle Theatre, 5100 Jog Road, Boca Raton, FL 33496. Located at the corner of Jog and Yamato Roads. This historical musical adventure takes you through the history of the best Jewish composers who contributed to the excellence in America's music. Performed by top Broadway and Theatrical talent from New York City and Los Angeles. WASHINGTON, D.C.— Today, the Israeli-American Council (IAC) and the Orthodox Union's Bring Israel Home (BIH) program announced a new initiative to strengthen Jewish continuity: the IAC will welcome more than 100 Birthright Israel alumni from the BIH program, along with Israeli soldiers, as part of its third annual National Israeli-American Conference, taking place Sept. 24-26 in Washington, D.C. The alumni will participate in the event's wide range of programming, including a special Shabbaton experience and sessions with thought leaders from Israel and across the Jewish world. "The IAC is thrilled to be partnering with the Orthodox Union to build the Jewish identity of our next generations and strengthen their connection to the State of Israel," said Shoham Nicolet, CEO of the IAC. "This event demonstrates the unique ways that we can leverage Israeli-Americans as a living bridge between the Jewish state and the Jewish people." As a part of the Orthodox Union, BIH runs a special post-Birthright program that works to maintain the relationship between participants and the Jewish community long after the trip. It "gameifies" participation in Jewish life, offering points for activities such as visiting a Jewish museum or reading an Israeli news article. Those who acquire enough points receive an all-expenses-paid weekend reunion — this year, at the nation's largest gathering of the Israeli-American community. "Partnering with the IAC on this reunion is a dream come true," said Rabbi Dave Felsenthal, Director of OU Next Gen. "Together we bring tremendous power to strengthen Jewish continuity and build a brighter Jewish future." The conference this year will in fact focus on strengthening three pillars critical for the Jewish future: the next generation, the State of Israel, and the Jewish Diaspora community. In particular, the conference will examine how Israeli-Americans, who constitute 10 percent of Jewish Americans, can serve as a living bridge to connect the Jewish people in Israel, America, and around the world. More than 2,000 activists from the Israeli-American and Jewish-American communities are expected to attend the conference, along with senior policymakers and diplomats, cultural icons, prominent thinkers and journalists, civic and business leaders, and many other influential voices from both the U.S. and Israel. Speakers include former New York City Mayor Rudy Giuliani; Israel's Minister of Construction Yoav Galant; former Israeli Defense Minister Moshe "Bogie" Ya'alon; renowned diplomat Dennis Ross; U.S. Congressman Brad Sherman; and Israel's Minister of Science, Technology, and Space Ofir Akunis. To attend, press must register at www.israeliamerican.org/conference. About the IAC: Headquartered in Los Angeles, the IAC is committed to building an engaged and united Israeli-American community that strengthens our next generations, the American Jewish community, and the State of Israel. The IAC strives to achieve these goals through programs and events for all ages— and by empowering and supporting a wide array of non-profit organizations within the Israeli-American community. For more information about the Israeli-American Council, please visit www.israeliamerican.org.